Adam graduated from the University of Chichester in 2013. 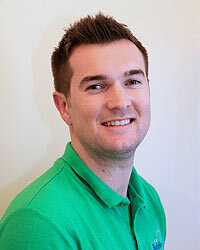 The passion for science, sport and healthcare lead him down the path of becoming a Sports Therapist. Working with world class sailors to desk bound office workers means that Adam has had the experience of dealing with all types of injuries and strives to keep you active and out of pain. After graduating Adam went to work with the Abu Dhabi Ocean Racing sailing team. This invaluable experience, lead him into the world of professional sport looking after world class athletes competing at the highest level. Training plans, nutrition and injury management were some of the roles and responsibilities within the team. Since then he has worked within busy private clinics treating a wide range of injuries and complaints being either sport or occupation related. Adam is qualified in Medical Acupuncture and the prescription of fully customised orthotics which can be important tools in the management of musculoskeletal pain. He believes that giving the correct advice and education about the mechanism of a patient’s pain is vital for self management and keeping active.